This wave of recalls shows there is a widespread problem with a particular type of product, but it’s not a universal recall of all via ferrata lanyards. Only some of the companies that make via ferrata lanyards have issued recalls and Edelrid have only issued a recall for some of the lanyards they have made over the last few years. It’s possible that differences in manufacturer and/or materials explain this (particularly as the safety concerns are focused on elasticated lanyards). It’s also possible that further recalls might come on the basis of the results of investigations or a decision from the UIAA. Whatever the case, we still have to trust that those manufacturers who haven’t issued a recall are justifiably confident in the safety of their products. I think we have little choice but to trust gear manufacturers if we want to practice mountain sports. 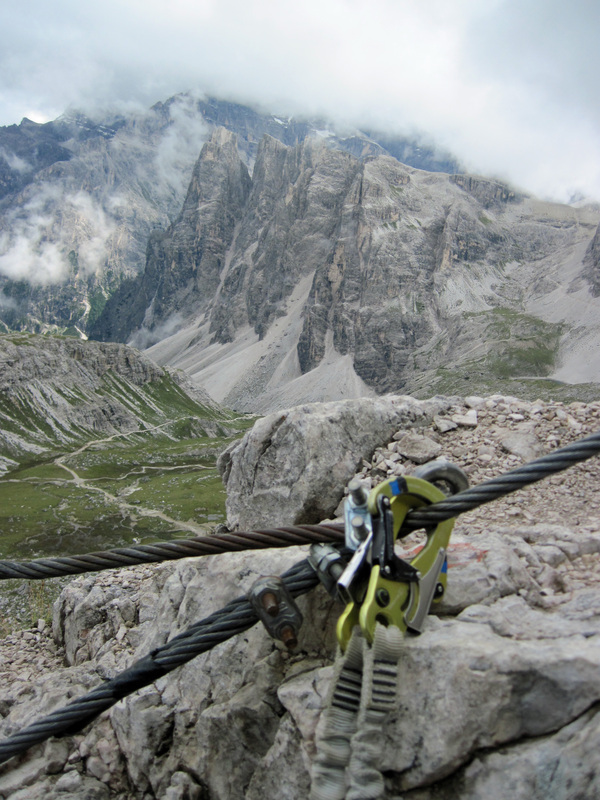 I didn’t hear about these recent recalls until today because I was using my Edelrid lanyards on via ferratas in the Dolomites. They aren’t covered by the recall and the recalls from the other manufacturers wouldn’t have introduced enough doubt into my mind to make me stop using them. An interesting question is whether these recall notices will be effective in getting people to stop using the affected lanyards. Petzl issued a recall notice for some of its Scorpio lanyards in May 2011 and reported that by October 2011 only 24% of the 100,000 lanyards covered by the recall had been collected for inspection. My hope is that people did learn about the recall and just decided to throw the lanyards in the bin rather than go through the effort of returning them to Petzl. My fear is that they either didn’t find out about the recall or did find out and kept using their lanyards regardless. It’s not possible to stop someone taking the needless risk of using a recalled product. The only thing to do is to warn people as much as possible and hope the warning is heeded. The recent wave of recalls have been well publicised and the warnings will reach the mountaineering and climbing community. Those it may not reach are the casual climbers who don’t read climbing forums or read the specialist media. Please spread the word. The British Mountaineering Council (BMC) is reporting that Salewa has issued a recall for its via ferrata lanyards. However, Salewa’s own website has a press release proudly proclaiming that its testing has concluded that all of its via ferrata lanyards function “flawlessly and, when used correctly, offers complete safety in the case of falls even with intentive usage.” As I usually trust the BMC as a reliable source of information, I find this a bit odd and recommend anyone owning a Salewa via ferrata set double check the situation with Salewa. UPDATE: On 13 September 2012 the UIAA issued a press release reporting on its emergency meeting. The UIAA recommended that all users of via ferrata sets check the websites of manufacturers to see if their unit is safe. The press release also states that the UIAA is to review the UIAA 218 safety standard (the one that applies to energy-absorbing devices, including via ferrata lanyards) to include a fatigue test. This UIAA press release and a press release from the German Alpine Club provide additional details of the fatal accident of 5 August 2012 that prompted this examination of via ferrata lanyards and the subsequent recalls. Both state that this accident involved both lanyards breaking due to both intensive use and the materials used. The German Alpine Club states that repeated stretching of the elastic lanyard led to a reduction in the strength of the fibers as elastic and strength-bearing threads rubbed against each other. Not all via ferrata lanyards are constructed with this mix of elastic and non-elastic fibres and this seems to be the reason why some via ferrata models have been recalled and others haven’t. However, it’s worth noting that these conclusions are the result of an investigation by the German Alpine Club and manufacturers and the accident is still being investigated by the Innsbruck District Attorney. This means that there may be further developments. UPDATE: in February 2013 a further wave of recalls were issued by manufacturers.